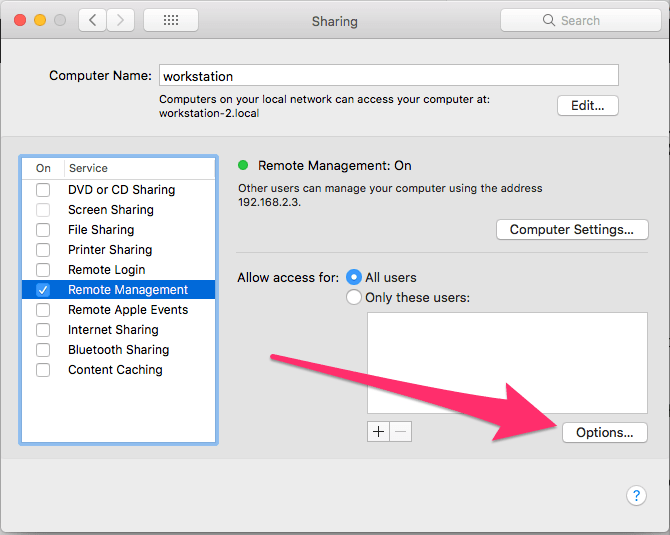 Continuing our run down of the options in the file sharing preference pane, we are going to explain the Remote Management option. 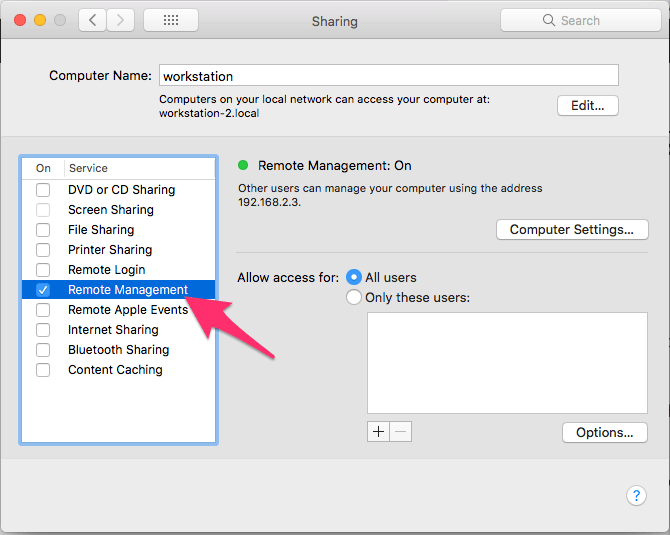 Remote management works with the Apple Remote Desktop app which is a paid app from the Mac app store, so you won’t need to use this service unless you want to allow other people to control your Mac using the Apple Remote Desktop app. 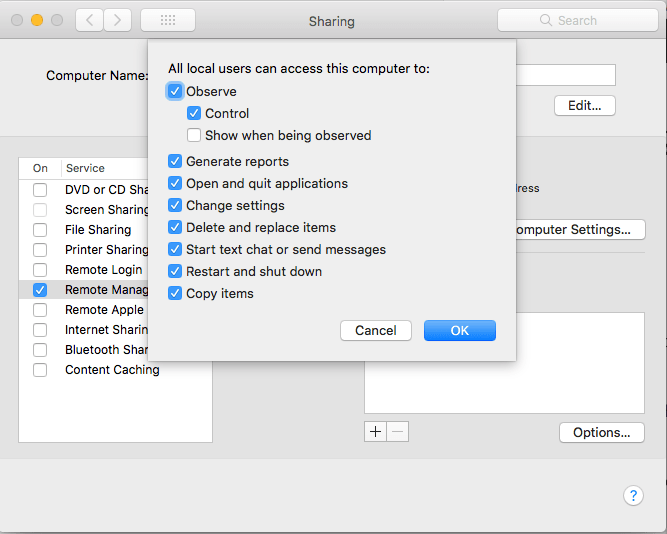 By default, all the options apart from “Show when being observed” will be selected and you should leave them set unless instructed by the person accessing your Mac or if you specifically don’t want them to have certain functions. 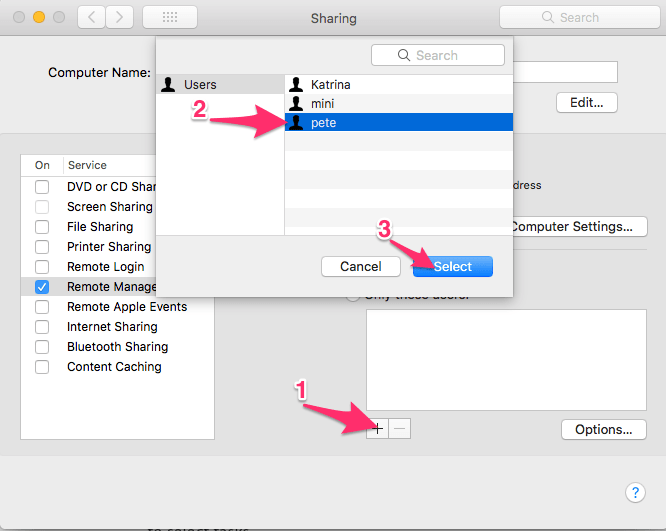 When it comes to whom can access your Mac via Remote Management, firstly in the Computer Settings options you can set Anyone may request permission to control screen, if you select this option a dialogue will open asking you to allow someone to access the Mac when they attempt to connect using Remote Desktop. In this same screen, you can also enable the option “Show Remote Management status in the menu bar” when selected an icon which looks like a pair of binoculars will appear in the menu bar which will show whether an Administrator is logged in and also allow you to message them. 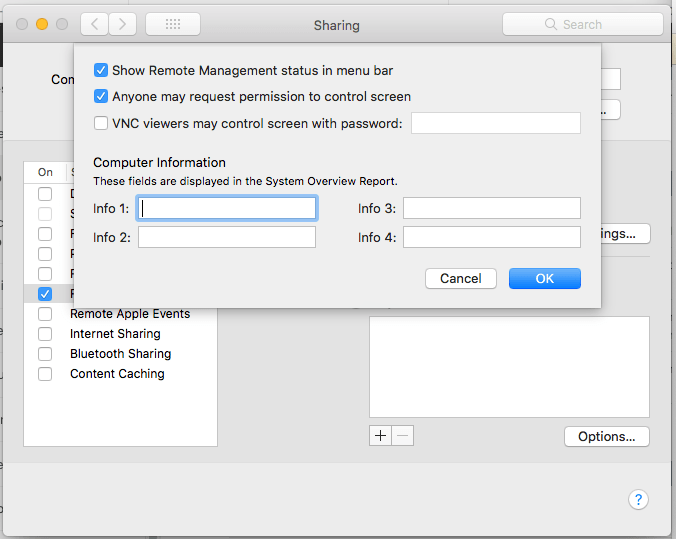 You can enable “VNC viewers may control screen with password:” and enter a password VNC clients can use to access, this is less secure than Apple Remote Desktop but useful if the person you want to control your Mac does not have Apple Remote Desktop. Lastly you can set the access permissions in the “Allow access for:” list, by default All users will be selected which will allow anyone with an account on your Mac to share the screen. 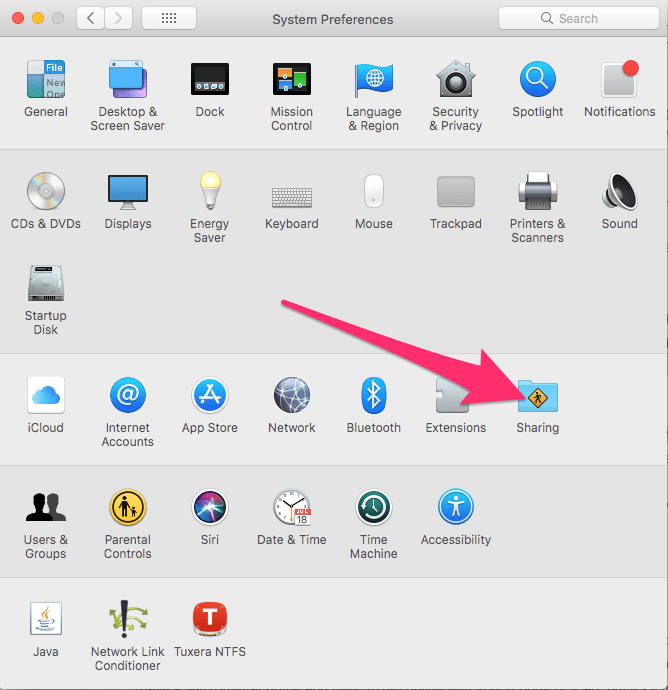 Or you can choose which users can access your Mac via remote Management by pressing the + plus button at the bottom of the “Allow access for:” list. As ever it is more secure to restrict the list of users able to access the Mac via Remote Management rather than to allow anyone with an account to access the Mac via Remote Management.